Generally, geographically dispersed networks are connected to one another through the MPLS VPN network of an Internet Service Provider (ISP). To help users understand their networks thoroughly and manage networks conveniently, NetBrain introduces a concept called MPLS cloud to simulate the MPLS functions accurately by following the rules of forwarding labeled packets. NetBrain MPLS cloud can generate virtual routing tables and use the routing tables to calculate paths between geographically dispersed network devices communicating via MPLS VPN. 1. Log in to Domain Management page. 2. Click Domain Manager under the Start Page or select Operations > Domain Manager from the quick access toolbar. 4. In the Add MPLS Cloud dialog box, enter the MPLS cloud name and description. 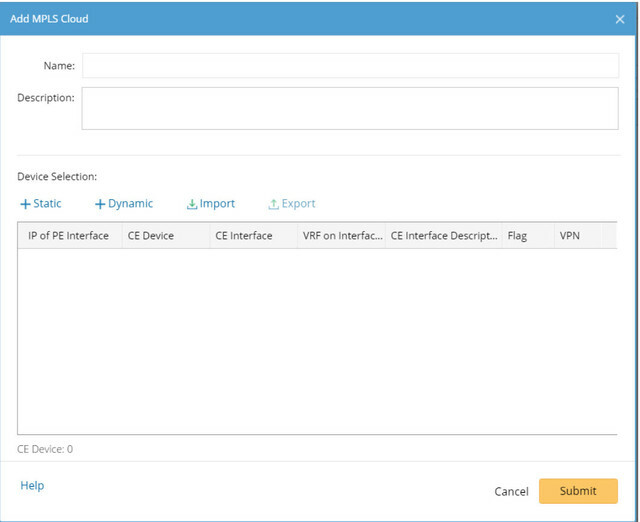 1) Click Dynamic in the Add MPLS Cloud dialog. 3) Click Search to search CE interfaces configured with the BGS AS and VRF you entered. 4) To automatically synchronize CE interfaces list with your live network, you can select the Auto update dynamic CE list via BGP AS# and VRF name check box. The update of the CE list will be triggered when you run a discovery or benchmark task. 5) Click Submit. Then a confirmation dialog pops up to ask if you want to rebuild IPv4 L3 topology. Click Yes or No according to your needs. 1) Click Static on the Add MPLS Cloud dialog. 2) Specify the properties of the CE device. a) Select the CE interface connected to the PE device. b) Select the routing protocol configured between CE and PE interfaces. c) Input the IP address of the PE interface. d) Input the VPN that the CE device belongs to if the VPN is available. ▪ Device configured EBGP Neighbor pointing to the AS number defined. ▪ Non-loopback interface in the same network segment with EBGP Neighbor IP configured on the device. ▪ The neighbor IP of CE devices does not exist in the domain. 6. Click Submit. A confirmation dialog box pops up asking if you want to rebuild IPv4 L3 topology. Click Yes or No according to your needs. To make the MPLS cloud have routes to the CE devices when calculating a MPLS VPN path, you need to generate a virtual routing table (VRT). ▪ Collect BGP advertised routes to MPLS Cloud from CE devices. devices and takes its connected CE interface as the next hop. 1. Move your mouse over the target entry and click the icon to select Generate Virtual Routing Table. 2. In the pop-up dialog, select a Data Folder from the drop-down list to use the cached route table of the MPLS cloud to calculate the virtual route table. ▪ Auto update global virtual route table - select the check box to automatically update the global virtual route table in the Current Baseline Data Folder. 2. Enter your username (or email address) and password. 4. Click the domain name from the quick access toolbar and select Manage Domain.